In the United States over 50% of the adult population consumes coffee. Teas, hot chocolates and ciders are also enjoyed by many but with all these drinks there is a window where the temperature of the beverage is not too hot, is not too cold. Scientific AmeriKen explore this zone in greater detail and identify how long it last, how long to microwave to get there and several other aspects to this “window of perfection”. 12 ounces of refridgerator cooled water (~11 ºC) was microwaved in individual trials where time was increased 30 second per trial and temperature was immediately assessed with an alcohol thermometer. 12 ounces of water was microwaved in a Scientific AmeriKen official mug for 2 minutes. Water temperature was measured with an alcohol thermometer and water was qualitatively assessed for enjoy-ability at 5 degree intervals. 12 ounces of water was microwaved in either a Scientific AmeriKen official mug or pride and prejudice artsy mug and declining temperature was assessed at 1 minute intervals. 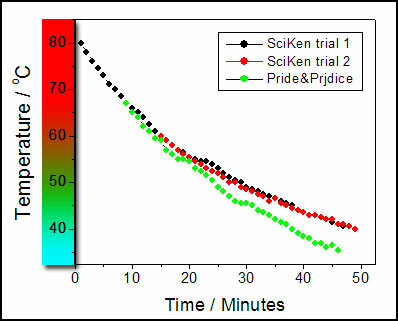 Our data show the decline of temperature to be fairly consistant as seen in the two trials with the Scientific AmeriKen (SA) mug (Figure below on left). It was also seen that the type of mug can influence the temperature loss curve as the pride and prejudice (P&P) mug lost heat at a faster rate. Sampling of the liquid at various temperatures identified an optimal temperature for drinking between 45-55 ºC (Indicated green on figure below and left). The water stayed in this range for 18 minutes (SA Mug) and 12 minutes (P&P Mug). 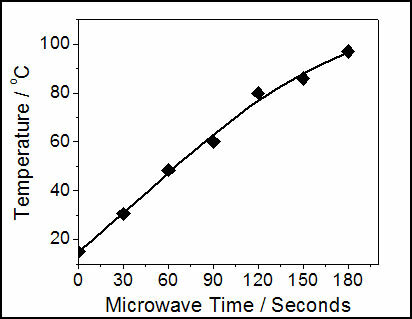 Analysis of the microwave heating of water found there was a general increase of ~0.5 ºC / second that slowed as the temperature approached the boiling point (Figure below on right). Optimal temperature was reached after 90 seconds of microwaving. This study has reached several intriguing data points including the window of optimal beverage temperature is about 15 minutes depending on the container. It is also important to note that overheating in the microwave can have deleterious results - as in one trial it took 20 minutes for the beverage to cool enough to be enjoyable. This study also provides a model to test many aspects affecting beverage temperature including whether the type of beverage has an effect, the volume of the liquid, and even as some have speculated, the color of the beverage. Finally, and of equal or even greater importance, this experiment has demonstrated the effectiveness, durability and superior functionality of the Scientific AmeriKen mug – available from the Scientific AmeriKen Online store today! Click here to visit Science Chat Forum to discuss this experiment!